Week 3 of our Twitter Leadership Follow Friday Project offers an XCEO, a great leadership resource and an engaging connector. 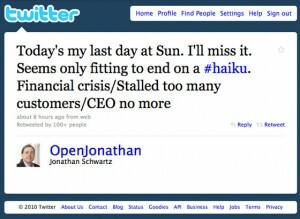 Jonathan Schwartz had the Twittersphere buzzing this week with his resignation haiku. Ok, @OpenJonathan is the not the most prolific Twitterer out there having only updated his account 36 times since joining in December 14, 2007. But he’ll soon have a lot more time on his hands so maybe he’ll spend some of it on Twitter. And, heck, any Fortune 500 CEO who writes a Twitter haiku resignation letter, is definitely worth following. Michael McKinney (“Lead From Where You Are. LeadershipNow works to build leaders at all levels and in all contexts.” – Pasadena, CA) is the guy behind the great LeadershipNow blog and corresponding Twitter account. Like @WallyBock, one of our first picks for the Twitter Leadership FollowFriday Project, McKinney runs a website which is a great resource for students of leadership. He joined Twitter in January 2009, has a little over 1,000 updates and about 4,200 Followers and is followed by about the same amount. His Tweetstream is is made up of original quotes, content from the blog and lots of RT’s (retweets). The LeadershipNow blog and Twitter are both must reads for all students of leadership. I met @MiaChambers (“Global Citizen. Digital Evangelist. Sushi Lover. Wannabe Granola. #MiaMafia” – Orange County, CA) through my @WeeklyLeader colleague and good friend @MVittone. Mia is amazing at engaging fellow Twitters and the content of her updates range far and wide. She’s the only person I know who uses the Favorites button more than I do (2,398 times!). She joined Twitter in February 2009, has 24,053 updates (this needs verifying cuz that’s a lotta TwitterTime), Follows 2,757 and has 4,078 Followers. Mia knows how to exercise leadership on Twitter, so Follow her! Do you have any favorite Leader Tweeters? Leave us a comment and if you’d like to guest host the column some Friday, let me know. Tagged with FollowFriday, Jonathan Schwartz, LeadershipNow, Mia Cambers, Mike McKinney, Twitter. Thanks so much for the inclusion, Peter. I love the way you're harnessing the power of #FollowFriday and setting an example of how to effectively connect with others using your blog. I'm taking notes and sharing them with others. Thanks for your efforts, my friend. It's strange that I never made the connection between Mia and leadership, but you are absolutely right, Peter. Mia (@MiaChambers) is without question the most genuine and authentic leader in this fresh new(er) world of web and marketing. Without guile or agenda other than to help – Mia shows everyone (anyone) by example how to navigate through the fog created by the new tools of the net. And, she does it in a way that is confident, spot-on-right, and that simply makes all of us trust her – truly and genuinely trust her. That is the best of what leaders do.